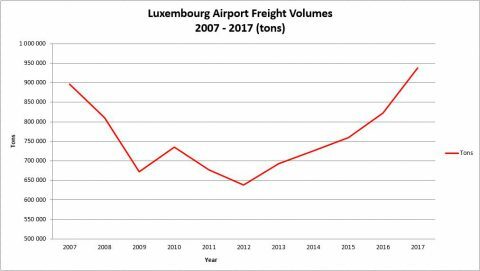 After announcing strong passenger figures for 2017, Luxembourg Airport can also look back to its most successful year yet for cargo. In 2017 a total of 938.000 tons airfreight passed through the airport. It took the airport 10 years to break the record of 2007 when 896.000 tons were handled. The financial crisis of 2008 caused cargo volumes to reduce significantly. Only since 2013 Luxembourg Airport was able to record continuous growth figures again. These strong results are thanks to the fast growth of worldwide air cargo demand. According to IATA figures, the worldwide airfreight volume grew 9% in 2017 expressed in Freight Tonne Kilometres (FTK), for Europe that figure was 11.8%*. Cargolux remains by far the largest cargo airline at Luxembourg Airport, flying freight from Luxembourg to the four corners of the world. 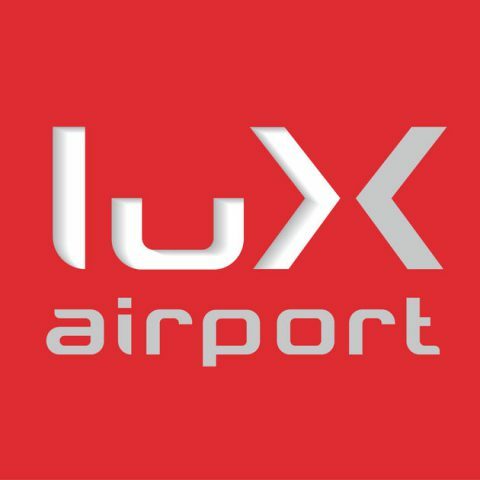 The special relationship between Zhengzhou Airport in China and Luxembourg Airport also resulted in strong traffic numbers, up to 15 weekly flights were operated between Luxembourg and Zhengzhou. Cargolux in May 2017 signed a cooperation agreement for air cargo with Emirates SkyCargo, followed by Emirates SkyCargo starting flights to Luxembourg in June with modern Boeing 777F aircraft. In 2017 lux-Airport also started building the new headquarters of Cargolux. The modern building on the municipal territory of Sandweiler will be located adjacent to Cargolux’s maintenance hangar. Qatar Airways, another strong contributor to the growth, is firmly in the second position, increasing its flights from 15 to 27 per week in 2017. Atlas Air remains in 3rd position, Silk Way West Airlines climbs to 4th spot and China Airlines is 5th in transported tons of freight at Luxembourg. Qatar Airways frequently brought its brand new Boeing 747-8 Freighters to Luxembourg. Like Cargolux, Qatar Airways also started to invest in these very quiet aircraft, next to the already very quiet Boeing 777 Freighters. Also Atlas Air and Silk Way West Airlines are flying these modern and quiet aircraft to Luxembourg. In order to cope with the growth of the cargo business, Luxembourg Airport started the construction of the extension of its Cargo Apron in early 2017. This will increase the total capacity of the cargo apron from 8 to 12 parking positions, all capable to accommodate Boeing 747-8F aircraft. The new extension will be equipped with a Hydrant Refuelling System, making aircraft fuelling operations safer and more efficient. The apron will also be equipped with energy-saving LED spotlights and environmentally-friendly underground power supplies to provide electricity to the aircraft, which replace diesel-powered units. The first 2 positions will be operational in September 2018, the last 2 positions at the end of October 2018. These works represent an investment of approximately 40 million Euro. In 2017 again many types of special cargo were transported via the airport. One of the specialties of the Cargocenter at Luxembourg Airport, operated by LuxairCARGO, is the handling of outsized cargo, which can only be transported with 747 freighter aircraft thanks to the large nose loading door which is unique for this type of aircraft. Another specialty is the transport of pharmaceutical products which require strict temperature control during the entire transport cycle. 31.000 tons of pharma products were shipped via the airport in 2017. Beside special freight like cars, helicopters and aircraft engines, thousands of animals traveled safely through Luxembourg Airport this year, e.g. Alpacas, Bison, Deer, Fish, Giraffes, Gorillas, Hamster, Horses, Kangaroo, Pigs, Swans, Turtles and Zebras.